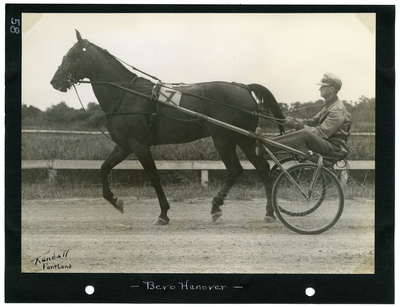 Black and white photograph of bay stallion Bevo Hanover wearing saddle number seven, W. Utton up for the 2.10 Class Trot on Thursday, July 11, 1940 at the Kite Track in Old Orchard Beach, Maine. Bevo Hanover won all three heats of the contest with times of 2.05, 2.04 3/4 and 2.06. The photograph is signed in the lower left corner by photographer Guy Kendall.